The MC-L series moving coil step-up transformers are used to amplify the low level output signal from a moving coil cartridge bringing it to the appropriate level to drive a moving magnet phono preamp. When terminated in 47k which is the standard input impedance of MM phono preamps the equivalent input impedance of each one would be: MC10-L 500 ohm / MC16-L 200 ohm / MC20-L 140 ohm / MC26-L 70 ohm. If additional loading is needed, it can be done through the parallel input or output RCA connectors. The MC-L series transformers are extra large size single C-core double coil transformers using a proprietary amorphous core material. Special winding techniques were developed in order to minimize inter-winding capacitances and maintain wide frequency response. They are optimized sonically to be as invisible as possible. The MC-L step up transformers were developed in conjunction with the Ypsilon VPS100 phono preamp. They can be used with most of the moving coil cartridges. 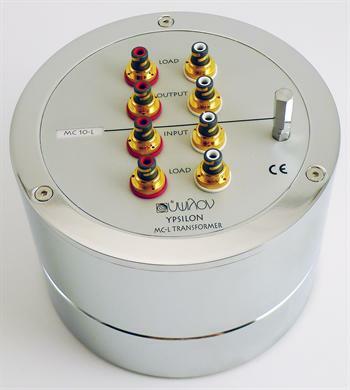 For optimum performance the MC-L transformers can be used within a specific range of cartridge output levels.